Because of all the moves we've made, we have to use the wonder of modern technology and keep in touch with old friends via the Internet. It isn't often (or in some cases, ever) that we get to go back to the places we've lived to see people face to face. One family we've kept in touch with throughout the years is our friends Jamie and Dawnette. 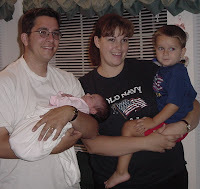 We met them on the 4th of July in 2002, when Nathan was just 18 months old. They'd just had a little baby girl and they had a son about a year older than Nathan. Both of them are originally from Southern California, and they travelled down here for the week to visit family, holding a special open house where all their So Cal guests could meet the newest member of their family. The drive was about an hour and a half, but waaaay shorter than the eight hour drive to where they live! Of course, since we moved away their family has doubled, they have another little boy and now another little girl. But they appear as if they themselves haven't aged a minute! It was great to catch up with them and let our kids play together almost exactly seven year after we first met. Of course, none of the kids remembered each other! But toss any group of kids into a pool and they become instant friends, all over again!